Der Artikel Hugo Wolf (1860-1903): Streichquartett d-moll wurde in den Warenkorb gelegt. Hugo Wolf is best known today for his extraordinary and highly popular Lieder; his small body of compositions for orchestra and chamber ensemble are, sadly, performed and recorded far less. 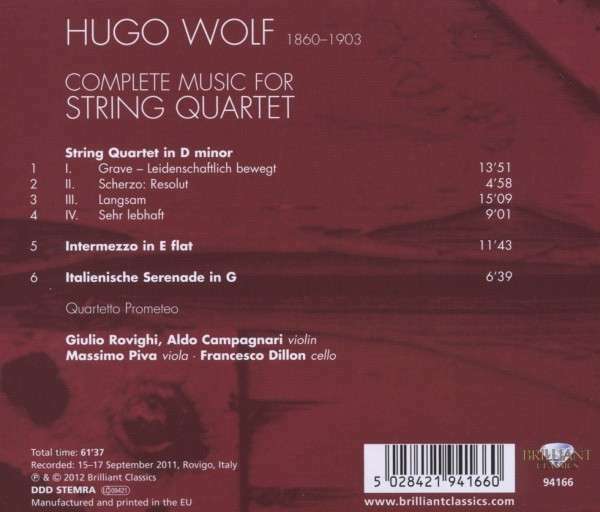 However, the works for string quartet recorded on this disc reveal the seriousness with which Wolf approached this small-scale genre. 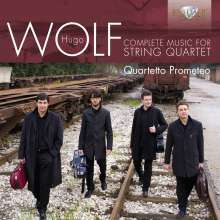 Wolf's interest in the string quartet grew out of his immersion in chamber music as a child -- his father organised musical evenings where family members would play the popular French and Italian repertoire together. The String Quartet in D minor was composed in 1878, when Wolf was 18 years old and living in Beethoven's old apartment. The legendary composer's influence can be heard in Wolf's work, along with a hint of Wagner -- Lohengrin in particular. The Intermezzo in E flat followed in 1886, a short piece that nevertheless displays Wolf's consummate skill in manipulating and developing a single theme to a state of considerable complexity. However, the Italienische Serenade is probably the best known of the works featured here, an extended rondo movement that conveys a curious mixture of passion and humour. Quartetto Prometeo's fine performances demonstrate a perceptive understanding of Wolf's musical genius, illuminating both the despair and sense of resolve that defined his character. An exciting new recording, this disc will be particularly welcomed by fans of the quartets of Beethoven, Schumann, Schubert and Brahms.